MEA member Carolyn Rink always wanted to go to college, but marriage and four children—a job and bills—got in the way. Last month, Rink not only started college nearly 40 years after graduating high school, but she took the plunge with her adult daughter. The mother-daughter duo—both first-time college students—are taking advantage of a new MEA member benefit that allows members and their families to obtain a free associate degree through an online, accredited public college. For Rink, an Associate of Arts degree will allow her to substitute-teach after she retires from her paraprofessional job in 10 years. For Rink’s daughter Cara—the mother of four children and a full-time letter carrier at the U.S. Postal Service—a Business Management degree could lead to a higher-paying office job at USPS. The program offered by MEA in partnership with Eastern Gateway Community College (EGCC) was announced in January. Recipients receive a “last-dollar” scholarship from EGCC that covers the costs of tuition, fees, and books that can’t be paid for through federal financial aid. To be eligible, students must apply for federal financial aid and use any grants or tuition reimbursement toward the EGCC bill. Any MEA members and their immediate families will be able to obtain an associate degree online from EGCC in one of eight different areas—at zero cost, regardless of financial need. MEA member Tami Tefft had already been through the process of filling out the Free Application for Federal Student Aid (FAFSA)—for her son, Paul. He holds a bachelor’s degree from Michigan State University and a master’s from Kendall College of Art and Design. The transportation secretary at Belding Area Schools said she once dreamed of being a teacher, but when she became a mother at 18 she dropped out of high school and turned to working to help raise her child and put him through college. Tefft went to night school to earn her General Equivalency Diploma 10 years after she would have graduated from high school. “I wanted to set the example for my son that education is important, and I knew I would not be able convey that to him if I myself had not graduated,” Tefft said. 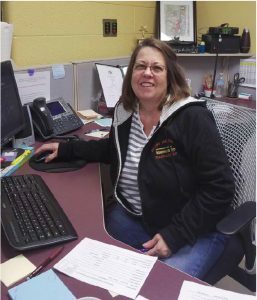 She worked as a custodian in Belding for 13 years before taking a secretarial position in 2006. Tefft has worked in various departments but has been turned down for central office jobs for lack of an associate degree, she said. Tefft signed up for MEA’s free college benefit the day after it was announced—calling the district where she works to request her high school transcript. “That felt pretty cool,” said the 52-year-old mother of one grown son. The president of her support staff unit in Belding, Tefft is excited for the opportunity to better herself, although she hasn’t decided which program of study she will pursue. Families of MEA members eligible to receive the free college benefit are children (or stepchildren), grandchildren (or stepgrandchildren), spouses, domestic partners, and financial dependents.